While hallmarks of rodent spermatogonia stem cell biomarkers' heterogeneity have recently been identified, their stage and subset distributions remain unclear. Furthermore, it is currently difficult to accurately identify subset-specific SSC marker distributions due to the poor nuclear morphological characteristics associated with fixation in 4% paraformaldehyde. In the present study, testicular cross-sections and whole-mount samples were Bouin fixed to optimize nuclear resolution and visualized by immunohistochemistry (IHC) and immunofluorescence (IF). The results identified an expression pattern of PLZFhighc-KITpos in A1 spermatogonia, while A2–A4-differentiating spermatogonia were PLZFlowc-KITpos. Additionally, this procedure was used to examine asymmetrically expressing GFRA1 and PLZF clones, asymmetric Apr and false clones were distinguished based on the presence or absence of TEX14, a molecular maker of intercellular bridges, despite having identical nuclear morphology and intercellular distances that were <25 μm. In conclusion, this optimized Bouin fixation procedure facilitates the accurate identification of spermatogonium subsets based on their molecular profiles and is capable of distinguishing asymmetric and false clones. Therefore, the findings presented herein will facilitate further morphological and functional analysis studies and provide further insight into spermatogonium subtypes. PLZF is present in As, Apr, and Aal4–16 undifferentiated spermatogonia,, while c-KIT is expressed in A1–A4-differentiating spermatogonia (Adiff), as well as in In and B spermatogonia and preleptotene spermatocytes (pL)., During neonatal development, these markers are co-expressed in a subset of spermatogonia. Furthermore, in adult mice, c-KIT has been reported to be expressed in undifferentiated spermatogonia, while PLZF expression has been seen in differentiating spermatogonia.,, Moreover, it has been suggested that a subpopulation of differentiating spermatogonia co-express PLZF/c-KIT,, but the exact identity of this specific subpopulation remains unclear. Bouin solution, a compound fixative, is routinely utilized to assess spermatogonial subsets in histology due to the robust nuclear morphological preservation that is obtained. Recently, Bouin and some other comparable fixatives have been reported to successfully detect testicular antigens and are replacing paraformaldehyde (PFA) and formalin fixation when performing cross-sectional immunochemistry (IHC) or IF.,,, Bouin has also been used in whole-mount IHC without hematoxylin nuclear-counterstaining. The aim of this study was to identify subtype-specific and stage-specific SSC molecular marker distributions by a combination of paraffin section IHC and corresponding hematoxylin-counterstaining whole-mount IHC and 4,6-diamidino-2-phenylindole (DAPI)-counterstaining whole-mount IF using Bouin fixation to maintain nuclear morphology. First, Bouin was used to determine the exact stage and subtype distribution of PLZF and c-KIT expression in As, Apr, Aal, A1–A4, In, and B spermatogonia in Stages I, III, V, VII, X, and XII (avoiding the mitotic division phases in Stages II, IV, VI, IX, and XI) using cross-section and whole-mount IHC counterstained by hematoxylin; the co-expression of PLZF/c-KIT, detected using whole-mount IF counterstaining with DAPI, was used to identify the subtype specificity of spermatogonia. Next, the compatibility of optimized Bouin procedure with other SSC molecules was further investigated using glial cell line-derived neurotrophic factor receptor alpha 1 (GFRA1), another marker of undifferentiated spermatogonia. Finally, in clones asymmetrically expressing GFRA1 or PLZF via hematoxylin-counterstaining whole-mount IHC, intercellular bridges labeled with testis-expressed gene 14 (TEX14) were examined using DAPI-counterstaining whole-mount IF. Eight- to ten-week-old adult male C57BL/6 mice (n = 9) were obtained from the Shanghai Laboratory Animal Center (SLAC, Shanghai, China), and three equal groups were established as follows: Group 1 was used to screen multiple players of spermatogenic epithelial cells and identify seminiferous stages following hematoxylin staining of whole-mount samples; Group 2 was used to establish stage and subset expression profiles for PLZF, c-KIT, and GFRA1 with cross-sections and whole-mount prepared samples and examined via hematoxylin or DAPI counterstaining IHC/IF; and Group 3 was used to observe nuclear morphology in GFRA1 and PLZF asymmetrically expressing clones in whole-mount IHC and intercellular bridges in GFRA1/TEX14 and PLZF/TEX14 whole-mount IF samples. Experimental protocols were approved by the Animal Care and Usage Committee of Central South University, Changsha, China (protocol number: LLSC (LA) 2016-031), and all animal procedures were performed in accordance with the approved guidelines and regulations. Adult male C57BL/6 mice were sacrificed by cervical dislocation, and testes were dissociated, cut transversely, and fixed in Bouin for 8 h at 4°C. The tissue was then dehydrated, embedded in paraffin, and cut into 5-μm sections following deparaffinization. Testis sections were treated with 100 mmol l -1 glycine at room temperature for 15 min and then 3% H2O2 for 10 min. The sections were then blocked with normal goat or rabbit serum (SP KIT-B2 or SP KIT-B5; Maixin Biotech, Fuzhou, China) for 2 h at room temperature. Next, the sections were incubated with primary antibodies, including rabbit anti-PLZF (1:200 dilution; SC-22839, Santa Cruz Biotechnology, Santa Cruz, CA, USA), goat anti-c-KIT (1:50 dilution; AF332, R&D Systems, Minneapolis, MN, USA), and goat anti-GFRA1 (1:50 dilution; AF714, R&D Systems) for 3 days at 4°C. Immunolabeling was detected by using biotinylated-linked secondary antibodies (SP KIT-C8 or SP KIT-C10; Maixin Biotech) and streptavidin-conjugated horseradish peroxidase (SP KIT-D2, Maixin Biotech). Sections were visualized using 3, 3'-diaminobenzidene hydrochloride (DAB; ZLI-9018, ZSGB-BIO, Beijing, China) and counterstained using Harris hematoxylin (BA4097, BASO, Zhuhai, China). All IHC sections were examined under a Sunny RX50 microscope (Sunny Optical Tech, Ningbo, China). The testes were decapsulated, and the seminiferous tubules were carefully separated with microdissection forceps under an Olympus SZX10 stereomicroscope (Olympus, Tokyo, Japan). Several intact seminiferous tubules were fixed in Bouin at 4°C for 2–4 h and then incubated in 100 mmol l −1 glycine at room temperature for 30 min. The samples were then dehydrated and rehydrated in a series of graded methanol (25%, 50%, 75%, and 100%). The tubules were then blocked in 0.3% bovine serum albumin (BSA; Sigma-Aldrich, St. Louis, MO, USA) and 5% donkey serum (Jackson Immunoresearch Laboratories, Lancaster, PA, USA) in PBS containing 0.05% triton X-100 (Sigma-Aldrich) overnight at 4°C. Then, the seminiferous tubules were incubated with primary antibodies, including rabbit anti-PLZF (1:200 dilution; SC-22839, Santa Cruz), goat anti-PLZF (1:50 dilution; AF2944, R&D Systems), goat anti-GFRA1 (1:50 dilution; AF560, R&D Systems), rabbit anti-TEX14 (1:100 dilution; ab41733, Abcam, Cambridge, UK), and goat anti-c-KIT (1:50 dilution; AF332, R&D Systems) for 3 days at 4°C. After the incubation, samples were washed 5 times with PBS containing 0.05% triton X-100 for 30 min. For whole-mount IHC, the seminiferous tubules were incubated with 3% H2O2 for 30 min and then incubated with biotinylated-linked secondary antibody and streptavidin-conjugated horseradish peroxidase (Maixin Biotech). Samples were visualized using DAB (ZSGB-BIO), counterstained with Harris hematoxylin (BASO, Zhuhai, China), mounted with aqueous mounting media (CW0137, CWBIO, Beijing, China), and imaged with a Sunny RX50 microscope (Sunny). For whole-mount IF, the primary antibodies were detected using donkey anti-goat conjugated to Alexa Fluor 594 or donkey anti-rabbit conjugated to Alexa Fluor 488 secondary antibodies (A21203 or A21206; Thermo Fisher Scientific, Waltham, CA, USA) and counterstained with DAPI (62248, Thermo Fisher Scientific). Images were obtained with a Leica TCS SP8 confocal microscope (Leica, Wetzlar, Germany). For whole-mount hematoxylin counterstaining histology, several 2–4 cm long seminiferous tubules were fixed in Bouin for 2 h at room temperature, dehydrated and rehydrated in a series of graded methanol, immersed in Harris hematoxylin (BASO) for 2 min, and differentiated in 0.1% acid ethanol for 30 s. The samples were then washed in tap water for 5 min, mounted with aqueous mounting media (CWBIO), and imaged with a Sunny RX50 microscope. In paraffin-embedded cross-sections and whole-mount IHC/IF samples fixed with 4% PFA, the spermatogonia and spermatocyte showed severe nuclear chromatin shrinkage and had a poor morphological appearance when compared with Bouin fixation. However, the ability to distinguish round and elongated spermatids did not differ between the two fixative methods [Supplementary Figure 1 [Additional file 1]], [Supplementary Figure 2 [Additional file 2]], [Supplementary Figure 3 [Additional file 3]]. Several spermatogonial subtypes, including A1–A4, In, and B spermatogonia, were identified in Stages I, III, V, VII, X, and XII by their nuclear characteristics [Supplementary Figure 4 [Additional file 4]], and their mitotic divisions were observed in Stages I, II, IV, VI, IX, and XI (data not shown). Seminiferous stages were identified based on spermatogenic cell associations as previously described. Intermediate spermatogonia were identified based on their characteristic ovoid nuclei with chromatin flakes entirely around the nuclear membrane. To confirm the corresponding spermatocyte and spermatid association in Stage III, nuclear morphological characteristics were scanned along the Z-axis using a light microscope. Since the stages of a seminiferous cycle are distributed in an orderly fashion along the tubules, the stages of adjacent segments were identified accordingly. B spermatogonia and mid-primary spermatocytes were observed in Stage V. In A1–A4-differentiating spermatogonia, slightly oval or round nuclei with little heterochromatin adhering to the nuclear envelope were observed. Multiple layers of stage-specific spermatogenic cellular associations were scanned to identify A2 in Stage X, A3 in Stage XII, and A4 in Stage I [Supplementary Figure 5 [Additional file 5]] due to their similar nuclear morphological characteristics and clone sizes. In stage VII, X, XII and I, A1–A4-differentiating spermatogonia were linearly distributed and separated by Sertoli cells, while in Stages III–V, the In and B spermatogonia were packed tightly. In cross-section IHC samples, strong PLZF and weak PLZF staining were located in two distinct subpopulations of A spermatogonia, though not in the In and B spermatogonia. In whole-mount IHC samples, PLZF staining was intense in As, Apr, and Aal4–16 spermatogonia across the seminiferous cycle and in A1 spermatogonia in Stage VII. Weak PLZF staining was seen in A2–A4 clusters during Stages IX–I, with no PLZF staining detected in In- and B-differentiated spermatogonia during Stages III–V. 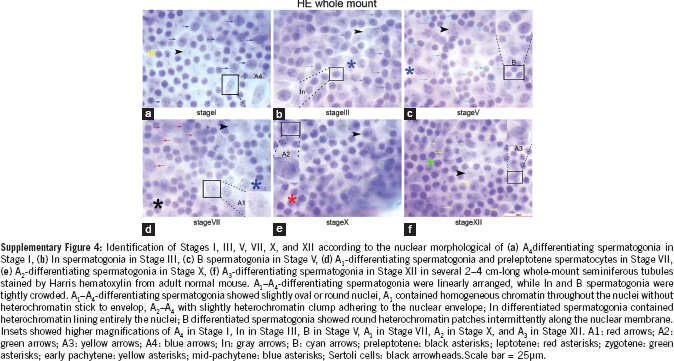 Nuclear details were identified using hematoxylin counterstaining, which provided clear, distinct identification of spermatogonial subtypes. PLZF staining was intense in Aal clusters that were separated by crowed In and B clones in Stages III–V. PLZF staining was strong in A1 spermatogonia in Stage VII and weak in A2–A4 spermatogonia in Stages IX–I, with cells linearly distributed and separated by Sertoli cells [Figure 1]. When hematoxylin counterstaining was not performed, loosely arranged and tightly lined PLZF strong clones mingled with PLZF weak clusters were observed, while their morphological subtypes were indistinct [Supplementary Figure 6 [Additional file 6]]. Figure 1: Expression profile of PLZF in cross section and whole mount IHC. PLZF was immune-stained strongly in undifferentiated A spermatogonia throughout the seminiferous cycle. (a) A4 was PLZFLOW in stage I, (b) In was PLZFNEG in stage III, (c) B was PLZFNEG in stage V, (d) A1 was PLZFHIGH in stage VII, (e) A2 was PLZFLOW in stage X, (f) A3 was PLZFLOW in stage XII in cross section and whole mount IHC. Aun: black arrows; A1: red arrows; A2: green arrows; A3: yellow arrows; A4: blue arrows; In: grey arrows; B: cyan arrows; preleptotene: black asterisks; leptotene: red asterisks; zygotene: green asterisks; early pachytene: yellow asterisks; mid-pachytene: blue asterisks; late pachytene: grey asterisks; diplotene: pink asterisks; meiotic division: cyan asterisks; Sertoli cells: black arrowheads; round spermatid: black triangles; elongating spermatid: red triangles. Scale bar=25 μm. PLZF: promyelocytic leukemia zinc finger; IHC: immunohistochemistry. In cross-section IHC samples, c-KIT was expressed in A, In, and B spermatogonia and PL spermatocytes around the seminiferous tubules. In whole-mount IHC samples, c-KIT expression was seen in A1–A4-differentiating spermatogonia during Stages VII–I, In and B spermatogonia during Stages III–V, and PL spermatocytes in Stage VII. In both the cross-section and whole-mount samples, no c-KIT immunostaining was detected in undifferentiated A type spermatogonia [Figure 2]. In whole-mount samples without hematoxylin counterstaining, c-KIT-positive clusters with progressively increased sizes were observed, and their subtypes were ambiguous because of the lack of nuclear morphological details [Supplementary Figure 7 [Additional file 7]]. Figure 2: Expression profile of c-KIT in cross section and whole mount IHC. c-KIT immune-staining was detected on the cytomembrane of several subtypes of differentiating spermatogonia. c-KITPOS was observed in (a) A4 in stage I, (b) In in stage III, (c) B in stage V, (d) A1 and preleptotene in stage VII, (e) A2 in stage X and (f) A3 in stage XII in cross section and whole mount IHC. No c-KIT staining was detected in undifferentiated A spermatogonia across the seminiferous cycle. Indicators of multiple germ cell types were the same as in figure 1. Scale bar=25 μm. In cross-section IHC samples, GFRA1 was expressed in a few of the A spermatogonia surrounding the seminiferous tubules. In whole-mount IHC samples, GFRA1 immunostaining was predominantly detected on the cytomembranes of As, Apr, and Aal4 undifferentiated spermatogonial clones with homogeneous hematoxylin-staining nuclei across the seminiferous cycle (Stages I–XII). No GFRA1 staining was detected in A1–A4-differentiating spermatogonia during Stages VII–I, in In- or spermatogonia during Stages III–V [Figure 3]. 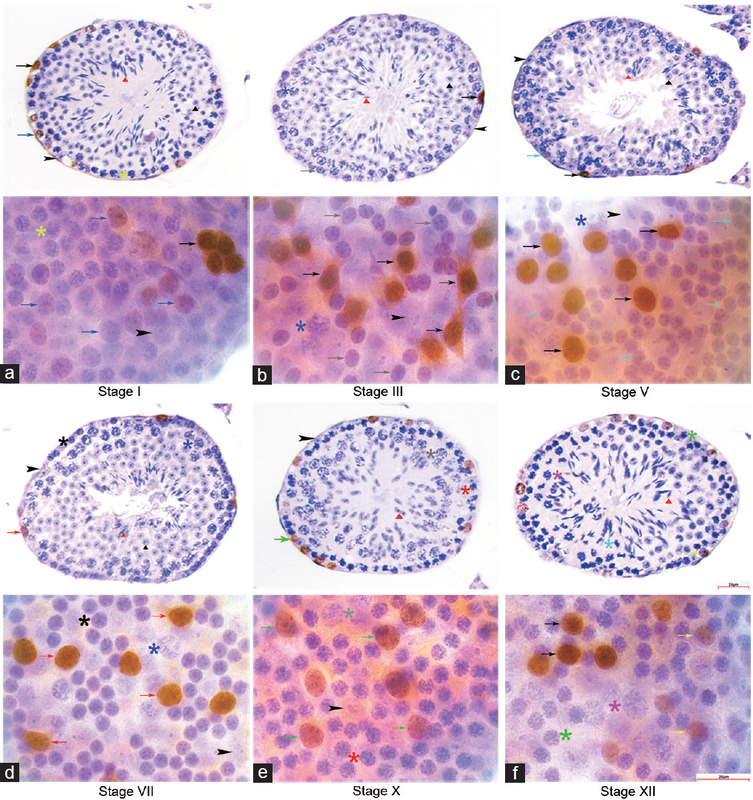 When hematoxylin counterstaining was not performed, GFRA1-positive As, Apr, Aal4 spermatogonia, occasionally Aal8 and Aal16 spermatogonia clones were discerned by counting the clonal cells; it was not certain whether intercellular bridges existed between them [Supplementary Figure 8 [Additional file 8]]. Figure 3: Expression profile of GFRA1 in cross section and whole mount IHC. GFRA1 immuno-staining was detected mostly on the cytomembrane of As, Apr and Aal4 undifferentiated spermatogonia clones across the seminiferous cycle. No GFRA1 staining was detected in (a) A4 in stage I, (b) In in stage III, (c) B in stage V, (d) A1 in stage VII, (e) A2 in stage X and (f) A3 in stage XII in cross section and whole mount IHC. Indicators of multiple germ cell types were the same as in figure 1. Scale bar=25 μm. To determine an accurate subtype-specific molecular expression profile, dual immunostaining with PLZF/c-KIT or GFRA1/PLZF was performed using whole-mount IF. When using DAPI staining for nuclear visualization instead of hematoxylin in whole-mount samples preserved by Bouin, spermatogonial subtype staining patterns were very similar. Briefly, Aun and A1 spermatogonial nuclei were ovoid with uniformly distributed chromatin in the nuclei, while A2–A4-differentiating spermatogonia contained heterochromatin that appeared mottled and were located around the rim of the nuclear envelope. The In spermatogonia displayed heterochromatin flakes lining the nuclear envelop with a central heterochromatin dot, while the B spermatogonia periodically exhibited round and compact heterochromatin along the nuclear envelope and at the center of the nucleus. In the PL spermatocytes, the nuclei became smaller, but the nuclear details remained similar to those of the B spermatogonia. The DAPI-stained nuclear characteristics of the A2–A4 spermatogonia were similar, but the characteristic germ cell associations in Stages X, XII, and I made them distinguishable. PLZF and c-KIT were co-stained in strongly PLZF POS A1 spermatogonia in Stage VII and weakly PLZF POS A2–A4-differentiating spermatogonia during Stages IX–I. In strongly PLZF POS As, Apr, and Aal spermatogonia, no c-KIT co-staining was noted [Figure 4]. Therefore, the exact co-expression of PLZF and c-KIT in A1–A4-differentiating spermatogonia can be delineated. Figure 4: Co-expression profile of c-KIT/PLZF in whole mount IF. (a) A4 was c-KITPOSPLZFLOW in stage I, (b) In was c-KITPOSPLZFNEG in stage III, (c) B was c-KITPOSPLZFNEG in stage V, (d) A1 was c-KITPOSPLZFHIGH in stage VII, (e) A2 was c-KITPOSPLZFLOW in stage X, (f) A3 was c-KITPOSPLZFLOW in stage XII in cross section and whole mount IHC. no c-KIT was detected co-staining with PLZFHIGH undifferentiated A spermatogonia throughout the seminiferous cycle. Aun: white arrows; A1: red arrows; A2: green arrows; A3: yellow arrows; A4: pink arrows; In: grey arrows; B: cyan arrows; preleptotene: white asterisks; leptotene: red asterisks; zygotene: green asterisks; early pachytene: yellow asterisks; mid-pachytene: pink asterisks; late pachytene: grey asterisks; meiotic division: cyan asterisks; Sertoli cells- white arrowheads; round spermatid: white triangles; elongating spermatid: red triangles. Scale bar=25 μm. In whole-mount IF samples, GFRA1 was co-located with strong PLZF staining in As, Apr, and Aal4 undifferentiated spermatogonia throughout the seminiferous cycles. No GFRA1 co-staining was detected in A1–A4-differentiating spermatogonia in stage VII, X, XII, and I regardless of PLZF intensity, and no GFRA1 was detected in PLZF NEG In- and B-spermatogonia or in PL spermatocytes during Stages III–VII [Figure 5]. GFRA1POS Aal8 was also co-located with strong PLZF staining [Supplementary Figure 9 [Additional file 9]]. Figure 5: Co-expression profile of GFRA1/PLZF in whole mount IF. GFRA1 was co-located with strong PLZF expression in As, Apr, and Aal4 undifferentiated spermatogonia throughout the seminiferous cycle. No GFRA1 was detected co-staining with (a) PLZFHIGH A4 in stage I, (b) PLZFNEG In in stage III, (c) PLZFNEG B in stage V, (d) PLZFLOW A1 in stage VII, (e) PLZFLOW A2 in stage X and (f) PLZFLOW A3 in stage XII in cross section and whole mount IHC. Indicators of multiple germ cell types were the same as in Co-expression profile of GFRA1/PLZF in whole mount IF. GFRA1 was co-located with strong PLZF expression in As, Apr, and Aal4 undifferentiated spermatogonia throughout the seminiferous cycle. No GFRA1 was detected co-staining with (a) PLZFHIGH A4 in stage I, (b) PLZFNEG In in stage III, (c) PLZFNEG B in stage V, (d) PLZFLOW A1 in stage VII, (e) PLZFLOW A2 in stage X and (f) PLZFLOW A3 in stage XII in cross section and whole mount IHC. Indicators of multiple germ cell types were the same as in figure 4. Scale bar = 25 um. 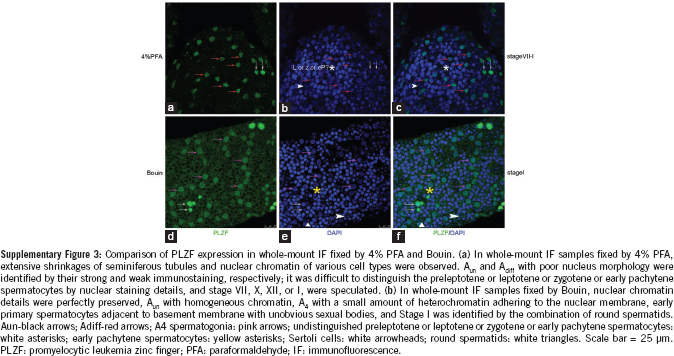 Asymmetric expression of GFRA1 and PLZF in spermatogonial clusters was observed in whole-mount IHC samples, with adjacent daughter cells connected by cellular bridges. In whole-mount IF samples, asymmetrically divided clones and false clones were further identified by TEX14/GFRA1 and TEX14/PLZF co-staining [Figure 6]. GFRA1 asymmetrically divided Apr clones were composed of one GFRA1POS member and one GFRA1NEG member, with cellular bridges labeled with TEX14 between them. GFRA1 asymmetrically stained false Aun clones were comprised of GFRA1POS and GFRA1NEG Aun clusters with similar homogeneous nuclear details. However, TEX14 staining was not detected between adjacent GFRA1POS and GFRA1NEG members despite an internuclear distance of <25 μm. In false PLZF clones, PLZF strongly stained Aun clusters and weakly stained Adiff clusters were arranged together, with TEX14-labeled intercellular bridges being absent between adjacent Aun and Adiff members with an internuclear distance of <25 μm. Furthermore, the nuclear details were different between the Aun and Adiff spermatogonia. Figure 6: Asymmetrically divided Apr clones, false Aun and Aun–Adiff clones were identified by co-staining TEX14 with GFRA1 and PLZF. (a) GFRA1 asymmetrically positive Apr clones in whole-mount IHC were identified as asymmetrical division by the presence of TEX14. (b) GFRA1 asymmetrically stained Aun clones in whole-mount IHC was identified as false Aun clone by the absence of TEX14 between adjacent GFRA1POS and GFRA1NEG clonal members. (c) a PLZF asymmetrically expressed Aun–Adiff clone in whole-mount IHC was identified as false Aun and Aun–Adiff clone by absence of TEX14 between adjacent Aun and Adiff clonal members. GFRA1POS or PLZFHIGH Aun: red arrows; GFRA1NEG Aun: yellow arrows; PLZFLOW Adiff : green arrows; IB in whole mount IHC: white arrowheads; IB between Aun connected by TEX14 in whole mount IF: white arrowheads; IB between Adiff connected by TEX14 in whole mount IF: green arrowhead; IB between asymmetrical GFRA1 or PLZF cells without TEX14 in whole mount IF– yellow arrowhead. IB: intercellular bridge. Scale bar=25 μm. In whole-mount IHC samples, 5 Apr and 8 Aun clones with asymmetric GFRA1 expression were identified out of a total of 196 GFRA1POS clones (5/196 = 2.55% and 8/196 = 4.08%, respectively), with intercellular bridges clearly observed. Out of 213 PLZF POS clones, 60 asymmetric Aun–Adiff clones composed of strongly PLZF POS Aun and weakly PLZF POS Adiff clones (60/231 = 25.97%) were observed, with intercellular bridges being more ambiguous. In whole-mount IF samples, 3 asymmetrically divided Apr and 10 false Aun clones were identified out of a total of 198 GFRA1POS clones (3/198 = 1.52% and 10/198 = 5.05%, respectively), with TEX14-labeled intercellular bridges present in Apr and lacking in Aun between the GFRA1POS member and GFRA1NEG member. Of the 145 PLZF POS clones, 36 false clones lacking TEX14 staining between strongly PLZF stained Aun and weakly stained Adiff members with an internuclear distance of <25 μm were identified (36/145 = 24.83%; [Supplementary Figure 10 [Additional file 10]]. 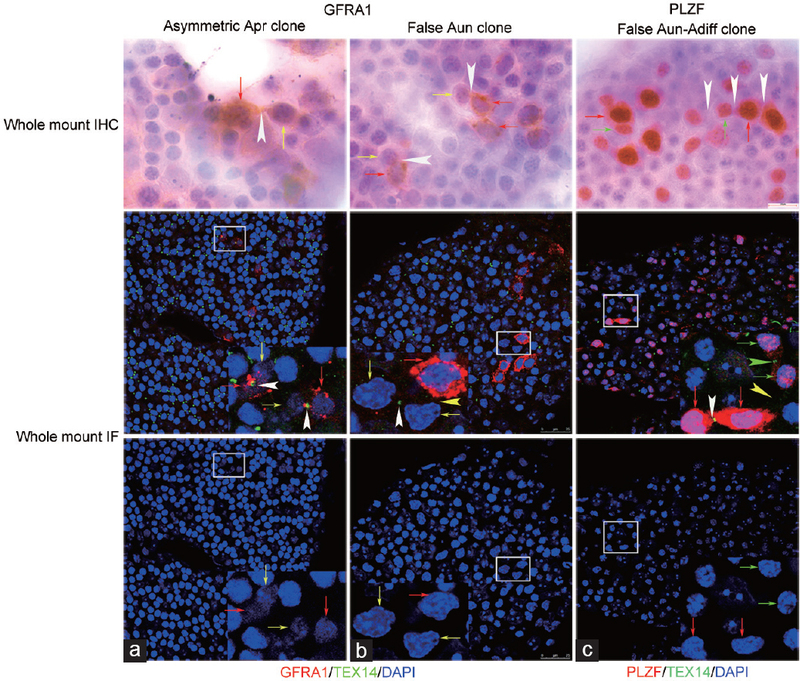 The distributions of GFRA1POS or PLZF POS clusters involved in the formation of asymmetric and false clones were evaluated using whole-mount IHC and IF samples [Supplementary Figure 10]). In GFRA1-stained whole-mount IHC samples, 3.96% As(4/101), 1.59% Apr(1/63), 3.33% Aal4(1/30), and 16.67% Aal8(2/12) spermatogonia were involved in Aun clone with asymmetric GFRA1 expression. Out of a total of 196 GFRA1POS clones, 5 asymmetric Apr clones (5/196 = 2.55%) were listed separately which consisted of a GFRA1POS and a GFRA1NEG member. In PLZF-stained whole-mount IHC samples, 31.65% As(25/79), 36.21% Apr(21/58), 13.95% Aal4(6/43), 18.92% Aal8(7/37), and 7.14% Aal>8(1/14) spermatogonial clusters were involved in Aun–Adiff clones with asymmetric PLZF expression. In GFRA1/TEX14 and PLZF/TEX14 whole-mount IF samples, asymmetric GFRA1POS Aun and PLZF POS Aun–Adiff clones were demonstrated to be false clones, with TEX14 staining being absent between adjacent asymmetric members. Furthermore, GFRA POS Aun false clones were formed by 3.70% As(3/81), 1.64% Apr(1/61), 6.25% Aal4(2/32), and 17.39% Aal8(4/23) spermatogonia. Out of a total of 198 GFRA1POS clones, three were asymmetric Apr clones (3/198 = 1.52%) that were listed separately and consisted of a GFRA1POS member and a GFRA1NEG member connected by a TEX14-labeled intercellular bridge. In the formation of PLZF POS Aun–Adiff false clones, 11.11% As(5/45), 23.08% Apr(9/39), 30.77% Aal4(8/26), 45% Aal8(9/20), and 33.33% Aal>8(5/15) were involved [Supplementary Figure 10]. When comparing whole-mount IF with whole-mount IHC, the percentage of GFRA1 asymmetric Apr clones was lower in IF relative to IHC (1.52% vs 2.55%), while the percentage of GFRA1 false Aun clones was higher in IF (5.05% vs 4.08%). We supposed that asymmetric Apr in IHC was identified as false Apr in IF by the absence of TEX14 between them. Furthermore, when comparing whole-mount IF with whole-mount IHC, the percentage of PLZF POS Aal≥8 clones associated with false clones increased, while the number of As and Apr clones associated with false clones decreased. This may be due to the fact that some, members of Aal clusters are far away from each other, therefore, some clonal members were mistaken for As or Apr owing to indistinct intercellular bridges between them in IHC and were instead confirmed as larger Aal>8 clones due to the presence of intercellular TEX14 staining in whole-mount IF. Heterogeneity of expression profiles has been revealed in SSC biomarker research.,,,,, there are two issues that need to be addressed: (1) how to accurately identify stage- and subtype-specific distributions of SSC molecular markers and (2) how to elucidate the regulatory signal pathways that are involved in each spermatogonial subtype during specific seminiferous stages. In the current SSC molecular study, stage-specific distributions was identified by labeling acrosomal development simultaneously. However, undifferentiated spermatogonia are inextricably commingled with differentiating spermatogonia during the entire seminiferous cycle, and the poor nuclear resolution associated with 4% PFA fixation, whether on cross-section or in whole mount, makes it difficult to distinguish them. Except for heterogeneity, numerous bimodal expression patterns have also been reported recently.,, For example, while PZLF and c-KIT are classical spermatogonial biomarkers that have been verified by genetic animal models and functional transplantation assays ,, and are widely used to identify Aun and Adiff spermatogonial subtypes, their exact expression profiles remain controversial.,,,, In addition to being expressed in undifferentiated spermatogonia, PLZF has also been found to be expressed in c-KIT-positive differentiating spermatogonia and three subgroups, including PLZF pos c-KIT neg, PLZF pos c-KIT pos, and PLZF low c-KIT pos, as identified by flow cytometry analysis., However, the exact distributions among spermatogonial subpopulations and their corresponding functions remain unclear. Therefore, this study focused on establishing accurate expression profiles for PLZF and c-KIT in spermatogonial subpopulations. In previous studies, the nuclear morphologies of spermatogonial subpopulations were identified using semi-thin plastic sections, with samples fixed in glutaraldehyde/OsO4 and stained with toluidine, or whole mount samples fixed in Bouin and stained with hematoxylin. More recently, paraffin cross-sections or whole-mount samples were utilized and fixed with Bouin and visualized with IHC or IF.,, In paraffin cross-section IHC samples, the nuclear morphology is compromised due to heat-induced antigen retrieval; in whole-mount IHC, hematoxylin counterstaining has not been performed to visualize the nuclear details. Thus, these methods alone make it difficult to identify molecular expression profile of spermatogonial subtypes accurately. In the present study, these measures were combined to solve this problem. First, chemical antigen retrieval was applied instead of heat retrieval to reduce the morphological damage induced by high temperature. Next, Bouin-fixed whole-mount IHC and IF were performed with hematoxylin and DAPI counterstaining. Our approach provided a nuclear morphology with SSC molecular immunostaining in paraffin section IHC, whole-mount IHC, and whole-mount IF samples fixed by Bouin, thus enabling the subtype- and stage-specific identification of immunopositive cells. The use of Bouin fixation and chemical antigen retrieval in this study enabled the identification of spermatogonial subtypes within immunopositive cells by perfectly preserving their nuclear morphology. 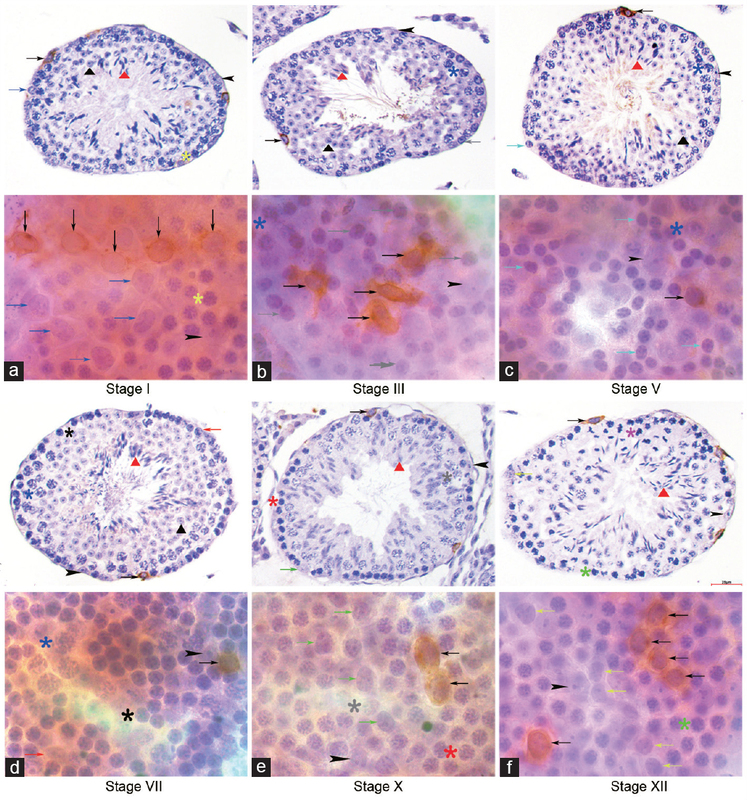 In Bouin-fixed seminiferous tubule cross-sections, A, In, and B spermatogonia and PL spermatocytes are roughly distinguishable based on their nuclear details, location, and association with multilayer germ cell types during a specific seminiferous stage. In whole-mount IHC samples, with the addition of hematoxylin counterstaining, As, Apr, and Aal undifferentiated spermatogonia and A1–A4-differentiating spermatogonia can be clearly detected based on their nuclear morphology and topographical clone arrangements. As A1–A4, In, and B spermatogonia collectively experience six successive division phases during Stages IX, XI, I, II, IV, and VI, respectively, stage- and subtype-specific expression models were examined in Stages I, III, V, VII, X, and XII based on nonmitotic nuclear appearance. Additionally, since A2–A4 spermatogonial clone sizes increase slowly due to density-dependent apoptosis, and A1–A4 spermatogonial nuclear morphology is comparable,, multiple layers of spermatogenic cellular nuclear morphology associations were scanned to identify A2 clones in Stage X, A3 clones in Stage XII, and A4 clones in Stage I [Supplementary Figure 5]. It has been reported that c-KIT POS-differentiating spermatogonia can revert to functional stem cells and reconstruct spermatogenesis after transplantation into a germ cell-depleted mouse recipient, the repopulating activity increases when c-KIT is co-expressed with undifferentiated molecular markers, such as OCT-4, GFRA1, or α6-integrin.,, Furthermore, density-dependent apoptosis is classically thought to exist when A1–A4-differentiated spermatogonia proliferate during Stages IX–I, with the number of A4 spermatogonia being only about 3.4 times as many as the A1 spermatogonia after three mitotic proliferations. Moreover, In- and B-spermatogonia secrete chalone to inhibit the proliferation of neighboring Aal undifferentiated spermatogonia, and Aal clones are largely quiescent during Stages III–VI until they differentiate into A1 spermatogonia at Stages VII–VIII. In a knockout mouse model, Bax and Bcl-xL were reported to be involved in density-dependent apoptosis. However, the molecular mechanisms and signaling pathways modulating the biological behaviors of these differentiating spermatogonial subpopulations remain unknown, and the specific chemical components of chalone have yet to be characterized. Therefore, it is able to identify and sort these spermatogonial subtypes using combined SSC markers of PLZF and cKIT to enable further characterization of their molecular mechanisms and biological behaviors. In the “As model,” As spermatogonia have been proposed to be true SSCs. In this model, the two daughter cells that are generated after division either migrate away and become two new As stem cells or remain together and form Apr spermatogonia that are connected by an intercellular bridge with an internuclear distance <25 μm., Furthermore, Aun spermatogonial clusters have also been reported to asymmetrically express SSC markers.,, Nevertheless, it remains unclear whether they are false clones with different nuclear details or absence of intercellular bridge, or true clones with similar nuclear characteristics and connected by an intercellular bridge. In this study, asymmetric GFRA1 expression in a few Apr spermatogonia was found to be accompanied by TEX14 staining between daughter cells; while asymmetrical GFRA1 expression in Aun spermatogonial clones was composed by smaller As, Apr, and Aal clusters without TEX14 staining; thus, they were false clones. These findings further strengthen the asymmetric Apr division that is seen in the “As model,” but the sample size herein was very small. These findings also support the “fragmentation model,” which claimed that larger Aal spermatogonial chains can fragment into As and Apr spermatogonia and renew their SSC characteristics.,, Thus, our future studies will focus on the in vivo dynamics of intercellular bridges within these spermatogonial clusters by using TEX14 and GFRA1 double transgenic mouse or other animal models. This study optimized the procedures that are utilized when studying SSC molecular expression by utilizing paraffin cross-sections and whole-mount IHC/IF samples that are Bouin fixed and counterstained by hematoxylin/DAPI. Furthermore, the exact co-expression pattern in A1–A4-differentiating spermatogonia was found to be PLZF pos c-KIT pos, and GFRA1 asymmetrical expression in Apr and Aal was found to be associated with asymmetrical division and false clones, respectively. The subdivision of cytological markers verified herein will significantly contribute to further analysis of the four events that occur during the seminiferous cycle in continuous spermatogenesis, including SSC self-renewal, SSC progenitor proliferation, Aal spermatogonial arrest in the G0/G1 phase, and Aal spermatogonial differentiation to A1. LQF designed and guided the research, and RLT performed the experiments. LQF and RLT analyzed the data and discussed the results. RLT wrote the paper, and LQF commented on the manuscript. This work was supported by the grants from the National Key Research and Development Program of China (Project No. 2016YFC1000200) and the National Natural Science Foundation of China (Project No. 31472054). Van Eenennaam H, Vogelzangs JH, Bisschops L, Te Boome LC, Seelig HP, et al. Autoantibodies against small nucleolar ribonucleoprotein complexes and their clinical associations. Clin Exp Immunol 2002; 130: 532–40. de Rooij DG. Stem cells in the testis. Int J Exp Pathol 1998; 79: 67–80. Oakberg EF. A new concept of spermatogonial stem-cell renewal in the mouse and its relationship to genetic effects. Mutat Res 1971; 11: 1–7. Lok D, de Rooij DG. Spermatogonial multiplication in the Chinese hamster. III. Labelling indices of undifferentiated spermatogonia throughout the cycle of the seminiferous epithelium. Cell Tissue Kinet 1983; 16: 31–40. Tegelenbosch RA, de Rooij DG. A quantitative study of spermatogonial multiplication and stem cell renewal in the C3H/101 F1 hybrid mouse. Mutat Res 1993; 290: 193–200. Lok D, de Rooij DG. Spermatogonial multiplication in the Chinese hamster. I. Cell cycle properties and synchronization of differentiating spermatogonia. Cell Tissue Kinet 1983; 16: 7–18. de Rooij DG, Grootegoed JA. Spermatogonial stem cells. Curr Opin Cell Biol 1998; 10: 694–701. Ahmed EA, de Rooij DG. Staging of mouse seminiferous tubule cross-sections. Methods Mol Biol 2009; 558: 263–77. Phillips BT, Gassei K, Orwig KE. Spermatogonial stem cell regulation and spermatogenesis. Philos Trans R Soc Lond B Biol Sci 2010; 365: 1663–78. Grisanti L, Falciatori I, Grasso M, Dovere L, Fera S, et al. Identification of spermatogonial stem cell subsets by morphological analysis and prospective isolation. Stem Cells 2009; 27: 3043–52. Gassei K, Orwig KE. SALL4 expression in gonocytes and spermatogonial clones of postnatal mouse testes. PLoS One 2013; 8: e53976. Schrans-Stassen BH, van de Kant HJ, de Rooij DG, van Pelt AM. Differential expression of c-kit in mouse undifferentiated and differentiating type A spermatogonia. Endocrinology 1999; 140: 5894–900. Yoshinaga K, Nishikawa S, Ogawa M, Hayashi S, Kunisada T, et al. Role of c-kit in mouse spermatogenesis: identification of spermatogonia as a specific site of c-kit expression and function. Development 1991; 113: 689–99. Niedenberger BA, Busada JT, Geyer CB. Marker expression reveals heterogeneity of spermatogonia in the neonatal mouse testis. Reproduction 2015; 149: 329–38. Hermann BP, Mutoji KN, Velte EK, Ko D, Oatley JM, et al. Transcriptional and translational heterogeneity among neonatal mouse spermatogonia. Biol Reprod 2015; 92: 54. Hobbs RM, La HM, Makela JA, Kobayashi T, Noda T, et al. Distinct germline progenitor subsets defined through Tsc2-mTORC1 signaling. EMBO Rep 2015; 16: 467–80. Mutoji K, Singh A, Nguyen T, Gildersleeve H, Kaucher AV, et al. TSPAN8 expression distinguishes spermatogonial stem cells in the prepubertal mouse testis. Biol Reprod 2016; 95: 117. Hobbs RM, Fagoonee S, Papa A, Webster K, Altruda F, et al. Functional antagonism between Sall4 and Plzf defines germline progenitors. Cell Stem Cell 2012; 10: 284–98. Dutta D, Park I, Mills NC. Fixation temperature affects DNA integrity in the testis as measured by the TUNEL assay. Toxicol Pathol 2012; 40: 667–74. 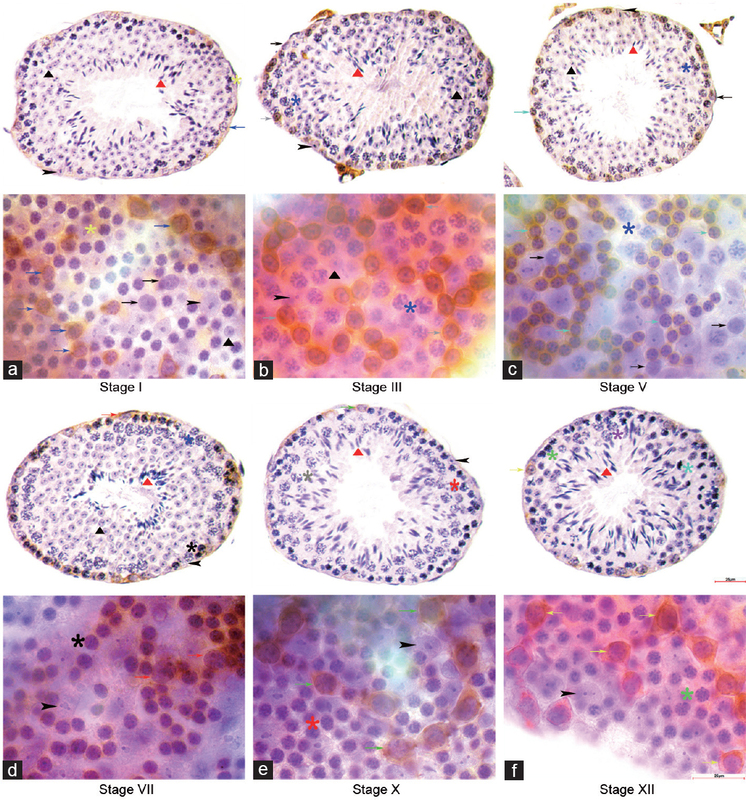 Howroyd P, Hoyle-Thacker R, Lyght O, Williams D, Kleymenova E. Morphology of the fetal rat testis preserved in different fixatives. Toxicol Pathol 2005; 33: 300–4. Latendresse JR, Warbrittion AR, Jonassen H, Creasy DM. Fixation of testes and eyes using a modified Davidson's fluid: comparison with Bouin's fluid and conventional Davidson's fluid. Toxicol Pathol 2002; 30: 524–33. Mazaud-Guittot S, Gow A, Le Magueresse-Battistoni B. Phenotyping the claudin 11 deficiency in testis: from histology to immunohistochemistry. Methods Mol Biol 2011; 763: 223–36. Hofmann MC, Braydich-Stolle L, Dym M. Isolation of male germ-line stem cells; influence of GDNF. Dev Biol 2005; 279: 114–24. Clermont Y, Bustos-Obregon E. Re-examination of spermatogonial renewal in the rat by means of seminiferous tubules mounted “in toto”. Am J Anat 1968; 122: 237–47. Nakagawa T, Nabeshima Y, Yoshida S. Functional identification of the actual and potential stem cell compartments in mouse spermatogenesis. Dev Cell 2007; 12: 195–206. Abid SN, Richardson TE, Powell HM, Jaichander P, Chaudhary J, et al. A-single spermatogonia heterogeneity and cell cycles synchronize with rat seminiferous epithelium stages VIII-IX. Biol Reprod 2014; 90: 32. Nakagawa T, Sharma M, Nabeshima Y, Braun RE, Yoshida S. Functional hierarchy and reversibility within the murine spermatogenic stem cell compartment. Science 2010; 328: 62–7. Mark M, Teletin M, Vernet N, Ghyselinck NB. Role of retinoic acid receptor (RAR) signaling in post-natal male germ cell differentiation. Biochim Biophys Acta 2015; 1849: 84–93. Buaas FW, Kirsh AL, Sharma M, McLean DJ, Morris JL, et al. Plzf is required in adult male germ cells for stem cell self-renewal. Nat Genet 2004; 36: 647–52. Costoya JA, Hobbs RM, Barna M, Cattoretti G, Manova K, et al. Essential role of Plzf in maintenance of spermatogonial stem cells. Nat Genet 2004; 36: 653–9. Ohbo K, Yoshida S, Ohmura M, Ohneda O, Ogawa T, et al. Identification and characterization of stem cells in prepubertal spermatogenesis in mice. Dev Biol 2003; 258: 209–25. Carnevalli LS, Trumpp A. Tuning mTORC1 activity for balanced self-renewal and differentiation. Dev Cell 2010; 19: 187–8. Chiarini-Garcia H, Russell LD. High-resolution light microscopic characterization of mouse spermatogonia. Biol Reprod 2001; 65: 1170–8. Huckins C, Oakberg EF. Morphological and quantitative analysis of spermatogonia in mouse testes using whole mounted seminiferous tubules, I. The normal testes. Anat Rec 1978; 192: 519–28. Dettin L, Ravindranath N, Hofmann MC, Dym M. Morphological characterization of the spermatogonial subtypes in the neonatal mouse testis. Biol Reprod 2003; 69: 1565–71. Muciaccia B, Boitani C, Berloco BP, Nudo F, Spadetta G, et al. Novel stage classification of human spermatogenesis based on acrosome development. Biol Reprod 2013; 89: 60. De Rooij DG, Lok D. Regulation of the density of spermatogonia in the seminiferous epithelium of the Chinese hamster: II. Differentiating spermatogonia. Anat Rec 1987; 217: 131–6. de Rooij DG. Spermatogonial stem cell renewal in the mouse. I. Normal situation. Cell Tissue Kinet 1973; 6: 281–7. de Rooij DG, Russell LD. All you wanted to know about spermatogonia but were afraid to ask. J Androl 2000; 21: 776–98. Helsel AR, Yang QE, Oatley MJ, Lord T, Sablitzky F, et al. ID4 levels dictate the stem cell state in mouse spermatogonia. Development 2017; 144: 624–34. Endo T, Romer KA, Anderson EL, Baltus AE, de Rooij DG, et al. Periodic retinoic acid-STRA8 signaling intersects with periodic germ-cell competencies to regulate spermatogenesis. Proc Natl Acad Sci U S A 2015; 112: E2347–56. Morimoto H, Kanatsu-Shinohara M, Takashima S, Chuma S, Nakatsuji N, et al. Phenotypic plasticity of mouse spermatogonial stem cells. PLoS One 2009; 4: e7909. Barroca V, Lassalle B, Coureuil M, Louis JP, Le Page F, et al. Mouse differentiating spermatogonia can generate germinal stem cells in vivo. Nat Cell Biol 2009; 11: 190–6. de Rooij DG. Effect of testicular extracts on proliferation of spermatogonia in the mouse. Virchows Arch B Cell Pathol Incl Mol Pathol 1980; 33: 67–75. De Rooij DG. Morphometric description of spermatogonial stem cells and expansion of their clonal derivatives. In: Orwig KE, Hermann BP, editors. Male Germline Stem Cells: Developmental and Regenerative Potential. Totowa, NJ: Humana Press; 2011. p. 89–105. van Beek ME, Davids JA, de Rooij DG. Variation in the sensitivity of the mouse spermatogonial stem cell population to fission neutron irradiation during the cycle of the seminiferous epithelium. Radiat Res 1986; 108: 282–95. Suzuki H, Sada A, Yoshida S, Saga Y. The heterogeneity of spermatogonia is revealed by their topology and expression of marker proteins including the germ cell-specific proteins Nanos2 and Nanos3. Dev Biol 2009; 336: 222–31. Hara K, Nakagawa T, Enomoto H, Suzuki M, Yamamoto M, et al. Mouse spermatogenic stem cells continually interconvert between equipotent singly isolated and syncytial states. Cell Stem Cell 2014; 14: 658–72.